Individually, the plans offer snapshots of what’s happening in every corner of the state. Each presents a localized picture of the next 40 years, with information about water supplies and demands, the local economy, population, and water use projections. Taken all together, they’re a sobering overview of the state’s economy and its water resources. A read of the 16 plans shows that many parts of New Mexico are still suffering from the economic impacts of drought, which hit ranchers and farmers particularly hard. Whether it’s the aquifer beneath Gallup or the Ogallala in eastern New Mexico, groundwater levels in many areas throughout the state are declining. If the Ogallala continues its current rate of decline, for example, it’s expected to dry near Clovis within 20 years. And while some places – like Las Vegas – are expanding reservoirs, evaporation from reservoirs already represents a significant loss of water. In the San Juan Region, for instance, evaporation each year from reservoirs accounts for nearly 6% of the region’s water use. Public drinking water, by comparison is just over 3%. Even as surface and groundwater supplies in many places are projected to decline even further, the state’s not saying how all these regional plans will fit into one comprehensive statewide plan that might guide New Mexico into the future. There is some good news, however: Despite earlier statements that a state water plan update wouldn’t account for climate change, each regional plan does include information about how warming has affected the Southwest over the past few decades and expected effects in the future due to continued warming. Each regional plan also includes information about water rights, rare species requiring protection under federal law, and current lawsuits that will affect future water planning. Local input can be found at the end of each plan, where stakeholders have proposed policies or projects that might address the gaps between future supply and demand. Even within individual regional plans, there is a diversity of suggestions, ranging from drilling new groundwater wells and reusing effluent water to working on watershed restoration and improving water infrastructure. The state needs to be “employing real data about the nature and conditions of the water resource, and taking into account impacts of climate change,” says former Water Dialogue president John Brown. The Water Dialogue is a statewide nonprofit group that promotes community-based water planning. Brown has long been active in water planning in the Middle Rio Grande—and has consistently raised criticisms of the ISC’s planning process. In the Middle Rio Grande, he says, where stakeholders, scientists, and others had done extensive studies of everything from surface water flows to groundwater pumping, the state ignored important data. “All the regions were told: this is your supply, this is your baseline,” he says. “We had better data, but we were told to use the Administrative Water Supply.” That is, the data provided by ISC. The plans should also incorporate the cultural and environmental values of each region’s people, he says. Another weakness, he says, has to do with the regional boundaries. Regions weren’t delineated by political jurisdictions like counties, nor by entire watersheds, like the Rio Grande. That further divides upstream and downstream users from one another. And it also means the process is “decoupled,” he says, from the actual work of managing water. The plans offer policy and project ideas. But no entities or agencies are responsible for implementing them. 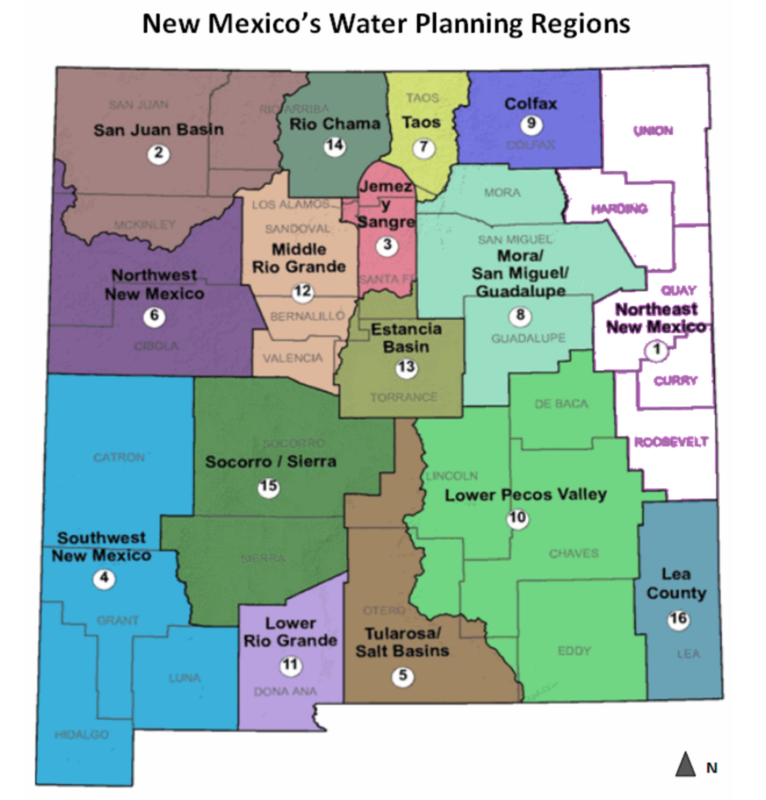 Regional water planning in New Mexico dates back to the 1980s. In the past, it had been undertaken without a uniform template, which made it difficult to feed all of the regional plans into one, statewide plan. This time around, ISC staff took care of that. They provided a template, and along with consultants hired by the state, wrote the bulk of each plan. And while each region had a consultant, funding, and a steering committee, not all the regions have groups like the Middle Rio Grande Water Assembly, a nonprofit group that’s been active in that region’s water planning since 1997 and whose members have expertise in a breadth of scientific disciplines. As for when the regional plans will actually be consolidated into one statewide plan, the ISC’s Public Information Officer, Melissa Dosher, could only respond that planning has begun and will continue into 2017. The state would not allow interviews with water planning staff, nor did ISC Director Deborah Dixon respond to interview requests. Next, the draft regional plans must be approved by the nine-member Interstate Stream Commission. According to the state’s website, those wanting to comment on the planning process or know about upcoming meetings can email ISC.WaterPlanning@state.nm.us.